Aritsugu is one of the oldest knifemakers in Japan. Founded in 1560, Aritsugu was originally a Japanese sword maker, and was appointed a supplier for the Imperial House of Japan. During the 17th and 18th centuries, as a more peaceful era emerged, they switched its primary production from swords to the pointed knives that were used to carve Buddha statues. In the late 19th century, Aritsugu started to focus on kitchen knives and cooking utensils, as there was strong growth in demand for cooking supplies. 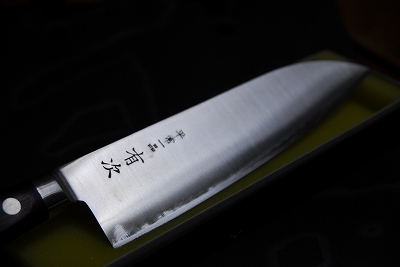 Ever since then, they have been producing the finest kitchen knives and cooking utensils that are valued and respected by Michelin-starred chefs from all over the world. Their one and only store is located at the Nishiki Market, the famous food market in central Kyoto known as "Kyoto's kitchen." There is another "Aritsugu" in Tsukiji market, Tokyo, but they separated from from Kyoto's Aritsugu back in 1918. The current proprietor of Aritsugu is Shinichiro Terakubo, who is the 18th generation to be involved in the running of the store since its inception. While he teaches cooking, knife sharpening and use classes through the shop, Aritsugu continues to spread the joy of food culture by putting their heart and soul into their knives and utensils.